In March 2015 Premier Kathleen Wynne appointed Lonsdale Group President Karen Pitre as Special Advisor on Community Hubs, to chair the Premier’s Community Hub Framework Advisory Group. A community hub can be a school, a neighbourhood centre or another public space that offers coordinated services such as education, health care and social services. The advisory group will review provincial policies and develop a framework for adapting existing public assets to become community hubs. •Examining best practices in Ontario and other jurisdictions. In August, 2015 the Community Hubs Advisory group published its first report “Community hubs in “Ontario: A strategic framework and action plan”. October 11, 2017 The Two-Year Progress report on Community Hubs in Ontario was published: A Strategic Framework and Action Plan. This report describes the progress made by the government of Ontario and its partners since the release of the one-year update of the “Community Hubs in Ontario: A Strategic Framework and Action Plan”. Community Justice Centres – The Ministry of the Attorney General conducted community needs assessments regarding the Community Justice Centre (CJC) model in three communities: Toronto, London and Kenora. CJCs apply an integrated approach to assess and manage low-risk vulnerable offenders. CJCs bring together justice sector stakeholders (e.g., judiciary, police, Crowns, and duty counsel), as well as health and community services (e.g., poverty, homelessness, mental health, and addictions) under one roof. The Community Hubs Summit, which brought together over 750 community, public and private sector leaders from across the province, the country and the world in May 2017. The Summit provided an opportunity to engage and discuss ideas and visions, best practices and practical advice for planning, building and sustaining successful community hubs. The development of the Resource Network, which has provided an online community wherein local service providers can exchange information and learn from the experiences of other local champions. The Network also includes tools, templates, training materials and an interactive mapper depicting demographic, socioeconomic, and service-level data which help community organizations perform detailed analysis regarding service needs in their communities. Changes to the processes for decision-making on surplus public properties, in order to foster integrated planning across government, and to reduce barriers limiting the ability of community groups to propose redeveloping surplus properties for community use. The development and launch of the Surplus Property Transition Initiative and Facilitation Program, two programs that provide support to community organizations seeking to realize their visions for community hubs. Governance model for a subsidiary Corporation: Research of existing precedents; drafting of a shareholders direction and articles of incorporation, including accountability requirements; negotiating a land acquisition process; developing an Asset Management strategy; and writing a Memorandum of Understanding between TDSB and the subsidiary corporation. Project management to satisfy Legislative/ regulatory change requirements: Investigation of requisite policies to meet accountability requirements and policies to support the operations of the subsidiary organization. Development of a Business Plan: Establishing the self financing components, start-up costs, budget, annual plan, and risk management considerations for the new organization. Organizational design: Assembling a list of potential Board members; interviewing Board candidates, hiring a Chair and CEO. Managing public consultations with stakeholders: Consulting with government ministries (Ministries of Education, Children Services, Health Promotion, PIR, Municipal Affairs and Housing, Energy), City Councillors, school trustees, TDSB staff and community groups. The Toronto Lands Corporation (TLC) was created in September 2007 as a wholly-owned subsidiary of the Toronto District School Board (TDSB). The TLC is responsible for managing the TDSB’s non-operating school assets, to optimize use for the community, and to maximize the value of these properties for the TDSB. One of the first projects of the TLC was to develop a master plan for TDSB-owned indoor pools, including rationalization of aging pools and developing community partnerships for aquatic programs in schools. The Lonsdale Group managed the feasibility study to develop facilities for indoor sport and recreation activities for Commissioners Park. A Regional Sports Complex will provide a multi-use, year-round recreation facility that serves community-based recreation needs and provides regional level recreation facilities. The facility being considered would provide regional sport facilities for ice sports, and indoor athletics year round. Phase 1 was completed and approved in January 2007. The City of Toronto is evaluating potential sites, prior to preparing tender documents and entering the construction cycle. The Lonsdale Group was hired in October 2006 to consult with the Ontario Ministry of Education and other relevant Ontario and Federal Ministries to plan for future recreation infrastructure and to look for better ways to finance infrastructure investments. The Lonsdale Group validated existing indoor pool asset studies and prepared a draft strategic plan for the Ministry of Education for purposes of discussion with the City of Toronto -Parks, Forestry and Recreation Division, regarding a future pool infrastructure and aquatic strategy. The bid committee hired the Lonsdale Group to review Toronto’s Bid Book, and provide advice regarding the venue plan. The Ontario Ministry of Tourism hired the Lonsdale Group in October 2009 to develop a strategy regarding the revitalization of Ontario Place, for Canada’s sesquicentennial in 2017 and the 50th anniversary of Ontario Place in 2021. 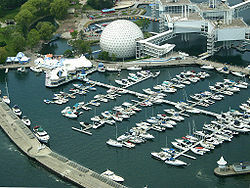 The strategic report submitted by the Lonsdale Group included a summary of relevant past studies regarding Ontario Place; a summary of the important stakeholder relationships including provincial ministries, the City of Toronto, the CNE Association, the Board of Governors of Exhibition Place, Waterfront Toronto, the general public and the local community; a recommended consultation process between government ministries, property development experts and the general public; and ongoing processes that will affect revitaliztion plans. This report is a high level overview of some of the issues that need to be reviewed before a decision is made to proceed with the revitalization. The University of Toronto hired the Lonsdale Group as the project manager for the purpose of negotiating a business deal to redevelop Varsity Stadium and Varsity Arena. The first stage of the process involved an assessment of the opportunities and challenges to the University. The Lonsdale Group worked with University, government, community and business interests to determine the program needs and the site development options. A clear understanding of these issues guided the development of the principles of the business deal. The Lonsdale Group was a member of the consulting and working group, producing a framework to develop 700 acres of new parks, public spaces and recreational opportunities to support TWRC’s commitment to creating a sustainable, green waterfront. 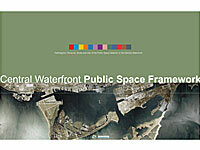 The framework includes: Parks and Recreation Projects Western Beaches Watercourse Commissioners Park Construction of interim sports field in the Port Lands Preliminary work for the development of a Port Lands regional sports complex Port Union Waterfront Park Mimico Park Harbourfront Water’s Edge Harbourfront Canada Square Tommy Thompson Park Starting the implementation of the Tommy Thompson Park Master Plan Completing the Park Framework Launching an international design competition for Lake Ontario Park. In July 2004 Toronto City Council adopted the recommendations on the City of Toronto Parks and Recreation Strategic Plan entitled “Our Common Grounds”. The strategic plan called upon the Parks and Recreation Department to “prepare a Sport Strategy Framework in partnership with Toronto Sports Council. The Lonsdale Group co-authored the Sport Framework, along with the Canadian Urban Institute – Centre for the Development of Community Assets and Ryerson University – Centre for the Study of Commercial Activity. The Sport Strategy Framework includes: Identification of district and regional facility requirements to increase sport opportunities for all participants from grass roots to elite athletes. Setting a foundation for working with other sport and recreation agencies to ensure that participants have maximum opportunities to learn, participate, train, compete, at all stages of the playground-to-podium continuum. Identifying the means to increase leadership capacity in sport by providing youth with opportunities to learn sports event management and coaching. 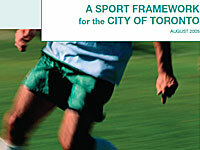 The Sport Strategy Framework included a survey to gather information regarding the challenges, needs and issues facing Toronto sport organizations. Survey results are summarized in the Sport Strategy Framework. CAAWS hired the Lonsdale Group to develop the Canadian Strategy for Girls and Women Through Physical Activity and Sport. CAAWS and two of its key partners, Sport Canada and Health Canada, are driving the development and implementation of the Canadian Strategy for Girls and Women Through Physical Activity and Sport. The Lonsdale Group worked closely with CAAWS to provide the necessary direction and to build the partnerships essential to launch the strategy. The Lonsdale Group developed a strategic plan for the design and construction of a “Sport School” for York Region. The essence of the plan was to build a constituency of support based on strategic partnerships and certain key messages. The positioning of the school required careful thought and discussion to ensure there was broad based support. Positioning sports schools in a wider orbit of specialty schools including performing arts and sports across the whole of the GTA / Golden Horseshoe allowed for the positioning of the sport school as building strong skills and strong communities in a context of the pursuit of excellence. These schools can then be linked to an entire landscape of resources/assets and benefits that suggest a wide range of partnerships. In turn the partnerships can be identified as ones that are immediately capable of providing support and others that will need to be developed. Responsibility for the Olympic Master Plan, facilitated the involvement of all three levels of government, the production of the Bid Book and the presentation in Moscow. The Olympic Master Plan required the co-ordination and integration of the architects, engineers and planners to come up with a comprehensive acceptable plan for the construction of all sports venues, Olympic housing, media requirements, transportation and infrastructure. The Master Plan lead to the commitment by the Mayor, the Premier and the Prime Minister for the waterfront redevelopment irrespective of whether the Olympic Bid was successful. The Master Plan developed for the Olympic Bid highlighted the opportunity presented by the revitalization of the Toronto Waterfront. The Lonsdale Group was hired as the consulting Executive Director of Electrification in November 2010 to complete the UP Express Electrification Environmental Assessment (EA), the Preliminary Design for the Electrification of UP Express and the Conceptual Design for the Electrification of the Lakeshore and Kitchener corridor. The ambitious 10 year electrification program for Metrolinx requires an expedited EA process for the electrification of the GO Network. Metrolinx is helping to transform the way the region moves by building a seamless, convenience and integrated transit network across the Greater Toronto and Hamilton Area (GTHA). As part of this project, GO Transit is expanding to enable 15-minute service on most corridors with electrified trains, which will enable faster and more service. Together, these infrastructure improvements will change how people move around Toronto and the region with four times the current number of GO train trips, service on evenings and weekends, and twice the number of trips during peak periods. The Lonsdale Group is assisting the Electrification team to develop and execute the TPAP communications and consultation plan. As part of the pre-consultation phase of the TPAP, Metrolinx held a first round of public meetings throughout February/March 2016. Starting in November, 2016 we will be assisting with community open houses to share information and updates on three of Metrolinx’s projects to build new track and electrification infrastructure. On Tuesday, October 11, 2017 Metrolinx made public the Notice of Completion for the Electrification Program EA A 30-day public review process has begun where stakeholders and the public now have a final chance to provide comments and feedback on the EPR before the 35-Day Minister’s Review period, which starts on November 10th. Congratulations to the Metrolinx EA team led by James Hartley and Amber Saltarelli. The Lonsdale Group was hired as Project Director Electrification in September 2009, working with the Community Advisory Committee (CAC), to define the scope of the Electrification Study and recommend the Terms of Reference for consideration by the Metrolinx Board of Directors. 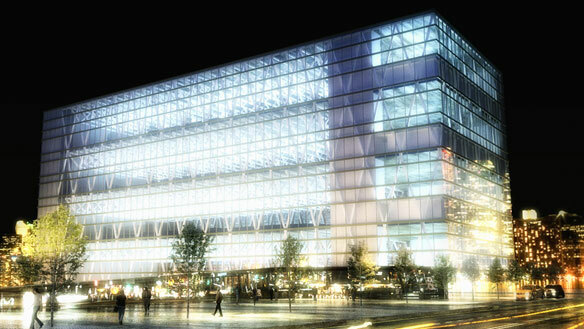 In November 2009, the Terms of Reference were finalized and a Request for Proposals was issued. Metrolinx awarded the contract for its study of the electrification of the GO Transit rail system, in December 2009 to a joint venture of Delcan Corporation and Arup Group Inc. the Lonsdale Group is leading the team of consultants with expertise in engineering, operations, community outreach, land use opportunities, environmental analysis, medical health assessments, technology options and cost benefit analysis for conventional and future diesel and electric technologies. The study commenced in January 2010 and was completed in December 2010. In April 2008, David Crombie, Chair of the Toronto Lands Corporation was appointed to present a report to the TDSB on options for long-term sustainable funding for pool infrastructure. The Lonsdale Group was retained as a consultant to Mr Crombie, to conduct consultations with the aquatics community and concerned community groups regarding pool closures. In May 2008, the Lonsdale Group organised an Aquatic Summit, hosted by the Toronto Sports Council, to assist David Crombie in his work to develop a long-term sustainable solution for the continued use of the Toronto District School Board pools. This work led to a commitment from the Provincial Government to fund a transition plan which included the establishment of an Aquatics Working Group (AWG). The AWG is made up of members of the community and stakeholders who are working together to devise a long-term solution. The Lonsdale Group worked with the AWG, Altus Group and Superior Pools to collect specific operating and capital costs for each of the 39 TDSB pools scheduled to close. The Aquatics Report was submitted TDSB Chair John Campbell in March 2009. 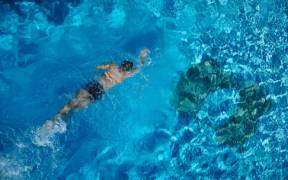 The report recommended a revised plan to close older, more expensive and less utilized pools, as well as a funding strategy to keep the remaining pools open. The strategy included a provincial government capital funding agreement, a flat-rate permit fee negotiated with aquatics users, and a stream-lined permit process designed to increase pool revenues for the TDSB. The Cherry Beach Sports Fields were designed to serve new and existing residents of Toronto, while reclaiming derelict, underutilized land. The project involved securing government funding, development of site selection criteria, and a site selection process. Once the appropriate site was determined, the project team retained consultants to build 2 artificial turf sports fields and necessary amenities. The Lonsdale Group managed the project from the funding stage, through site selection, design and construction. 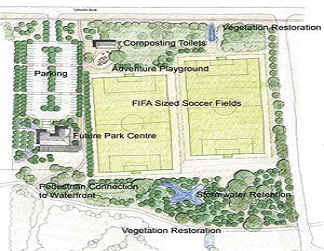 In addition to meeting an important recreational need, the sport fields project also has strong environmental benefits including; (a) doubling the number of trees (about 800 new native trees will be planted as part of the project) (b) Clean-up of contaminated land – bringing the site up to acceptable standards through a clean-up strategy that has been discussed with public health and environment officials, (c) Storm-water management – an effective storm-water management system will also be installed as part of the project and runoff will be monitored on a continual basis. The field turf provides a quality playing surface, which is subject to minimal wear and tear, is playable in all types of weather conditions, and extends the playing season dramatically. In September 2004, the Lonsdale Group Inc was the project manager for the preparation of a study to investigate the feasibility of constructing a multi-sport watercourse facility. The Lonsdale Group and the Toronto and Region Conservation Authority (TRCA) completed the $23 million Western Beaches Watercourse Facility on-time and on budget in July 2006. The new watercourse, located west of Ontario Place fronting on Marilyn Bell Park, hosted the 2006 International Dragon Boat Federation Club Crew World Championships from August 8-13, 2006. The facility is now used as a permanent city-owned ‘flat water’ training and competition venue for Toronto’s rowing and paddling community. 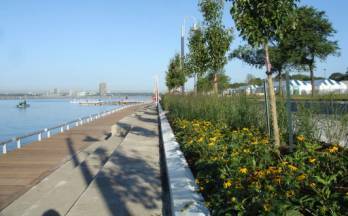 Starting in 2005/06, TWRC began making improvements and additions to Martin Goodman Trail. 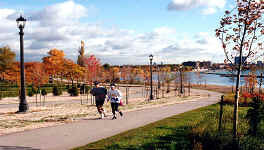 The Lonsdale Group was the project manager overseeing the design, approvals and construction of the section of trail through Marilyn Bell Park to Ontario Place. Leslie Street is one of the major gateways to the Port Lands and the future Lake Ontario Park. The Lonsdale Group and TEDCO completed Phase I of the project including landscaping and Martin Goodman Trail improvements on the eastside of the street between Lake Shore and Commissioners Street and on the west side south of Commissioners Street. The Lonsdale Group was a member of the Program Management team, on behalf of the TWRC to plan Commissioners Park, a 41-acre waterfront park located in the Port Lands between the Keating Channel and Commissioners Street. The park is being designed to be both a waterfront landmark and an active recreation space, to meet the future needs of new waterfront communities in the West Don Lands, East Bayfront and Port Lands. Commissioners Park is to be one of the principal active recreational facilities to serve the local, waterfront and district population. It is envisioned that Commissioners Park will include a combination of outdoor facilities such as soccer, field hockey, bocce, lacrosse, ultimate frisbee and other sports. These will be supported by indoor facilities including change rooms, washrooms, meeting rooms, concession stands, etc. This project examined the feasibility of integrating brownfield restoration with the development of a community recreation facility in a Toronto waterfront location. The study addressed four main issues: i) the growing gap between recreation facilities and population growth (ii) the need for a new approach to funding recreation facilities (iii) that community based sport and recreation are an important part of social integration and human development, and (iv) brownfield redevelopment allows community recreation planning and environmental remediation processes to be integrated and streamlined. The report proposed a new approach to funding recreation facilities and a business plan that integrates environmental regeneration and recreational facility design and programming. Eight sites were examined against four selection criteria in Toronto’s central/eastern waterfront, and a short list of three sites was recommended. In addition the study established eight criteria for evaluation of the short listed sites, including cost and revenue factors. This study, commissioned by the City of Toronto Parks and Recreation Division and the Toronto Sports Council, involved an inventory of sport and recreation facilities, a review of funding models, a sport community survey, and stakeholder interviews. A database of sport facilities was developed for arenas, gymnasia, fields and pools. A number of data fields were established to note characteristics such as geographic location (postal code), age, dimensions, seating capacity and amenities (i.e. showers, snack bar, parking, lights). A four-level hierarchy was established to rank each facility based on facility service levels, corresponding to stages in the sport development system. The facility hierarchy can be linked to various socio-economic and demographic trends to identify service gaps based on community growth and sport development. The framework concluded that there is a severe lack of district and regional facilities in Toronto, which creates overcrowding at the neighbourhood level and is a critical barrier in the sport development system. The Lonsdale Group validated existing indoor pool asset studies and prepared a draft strategic plan for the Ministry of Education for purposes of discussion with the City of Toronto – Parks, Forestry and Recreation Division, regarding a future pool infrastructure and aquatic strategy. The strategic plan contained maps showing pool location, ownership and status. The Lonsdale Group developed the Venue/Sport Map & Legend that was submitted with the proposal to host the Ontario Summer Games in August 2012. The proposal was approved by Toronto City Council in July 2010 and awarded to the City by the Ontario Sport Alliance in August 2010. The Lonsdale Group input facility data to provide a searchable database of arena, field and gym locations, as well as a searchable database of local clubs by sport for the City of Toronto. As of December 2010, 311 Toronto is using the database for inquiries about sports organizations. 311 Toronto provides non-emergency City services, programs and information. This project mapped global positioning satellite (GPS) data of occupational Inuit hunters in Iqaluit in order to track land use changes related to climate change. The GPS tracking data and hunter interviews were synthesized into maps detailing hunting route deviations as well as the conditions necessitating route alterations. The Lonsdale Group developed and maintained the GPS database, as well as the mapping data layers and Google Earth visualization data layers. The project’s combination of scientific monitoring techniques and Inuit knowledge (IK) is helping to visualize the changing adaptive capacity and vulnerabilities of Inuit hunters to climate change in the Iqaluit region of Baffin Island.